We open with hosts Noel Fielding and Sandi Toksvig talking by Noel's wee outside tent. Why isn't tiny Sandy in there with the rest of the lot? She's got an Irony Clause in her contract and we're away! 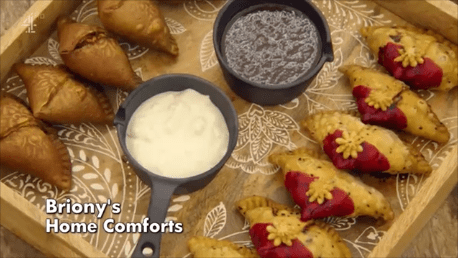 We're on with a quick recap of last week: shy Kim-Joy was Star Baker and we lost Karen Wright and Terry Mustachio to a double elimination. It was very sad, there were all sorts of tears for widower Terry and a rueful determination to take a break from our boozy-baking Karen. Let's find out what's shaking this week! 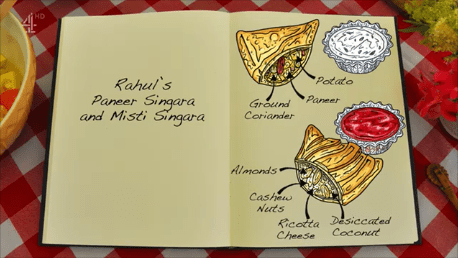 Will shy "little genius" Rahul Mandal with the fancy new haircut regain his Star Baker crown? Will Dan Beasley-Harding find his lost mojo? Will Briony and Manon live up to the potential so evident in episode 1? Will Ruby murder another Technical Challenge without breaking a sweat? 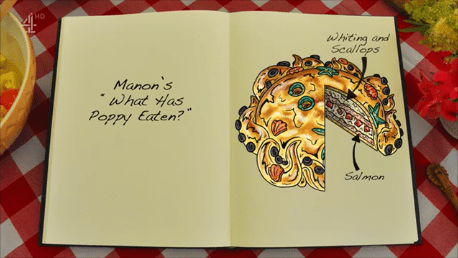 All these questions and more: to be answered in the next 56 minutes on The Great British Bake Off! Jon Hendricks has broken out a new Hawaiian shirt for Pastry Week, but don't let the sartorial jauntiness fool you, he's ascurred of Pastry Week. It can eat you. ALIVE. I don't know what anyone else said because I was busy trying to look at everything on Briony Williams' shirt: it's Alice in Wonderland! We rush right in with the Signature Challenge. 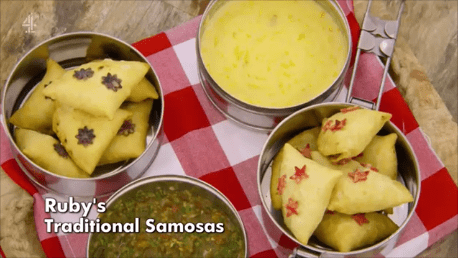 Judges Prue Leith and Paul Hollywood require six sweet and six savory samosas. I should not be watching this while hongray. 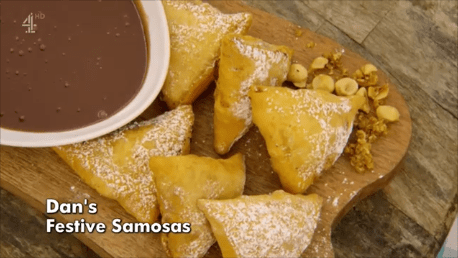 The thing about Samosas: you have to get your pastry thick enough to withstand the filling but not so heavy that it overwhelms. Right, as you were! We all stare at our East Asian bakers, Ruby Bhogal's not having any of that. 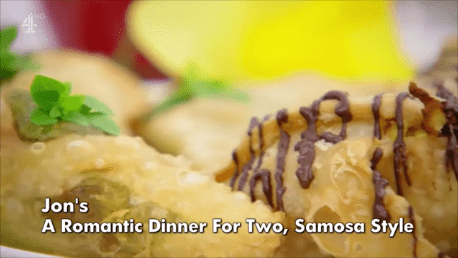 She'd be happy to never see another samosa ever. Rahul? 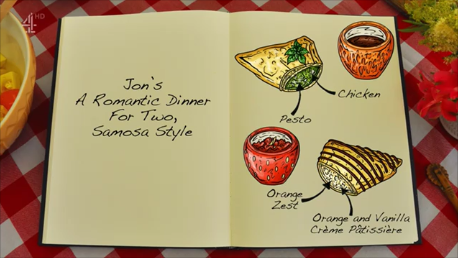 Jon gets the first critique, seems samosas were how he wooed his wife back in the day. I really thought he'd bring up his daughters again, but I guess he kind of COULD be. I don't know how well the wooing went and how long it went on! Argh Ruby is cutting up her onion with a tiny little paring knife. Note to self: Ruby is a baker, not a cook. She's going traditional and is feeling the extra cultural pressure. 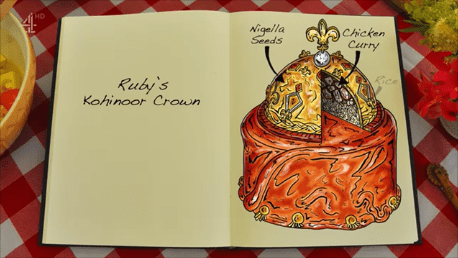 She's using her mum's chutney recipe! 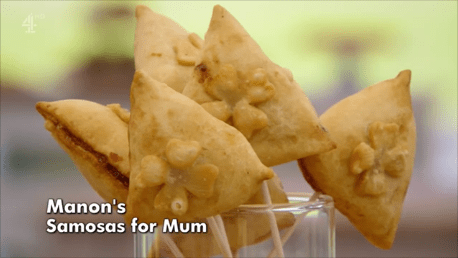 Rahul, on the other hand, has been workshopping his samosa recipes with his mum, who made some last night. Lookit all the nuts! Briony's baking for her husband again, goodonya! At least these aren't treacle tarts, but I'm not eating any of that except for the cheesecake stuff. 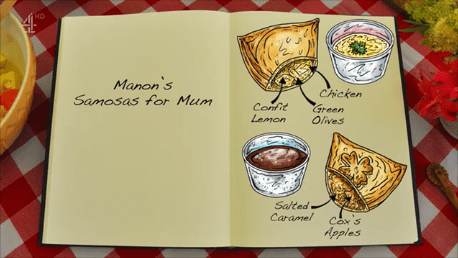 Manon Lagreve is cooking for her mum but Paul's worried her filling might be too dry. Everyone rolls and rolls and rolls their dough, Dan's working his pasta roller instead. He's "too posh to push" and I shall hashtag that immediately. His filling sounds yummy but he used the pasta machine too much and wrecked his dough. He's got to start again AGAIN! 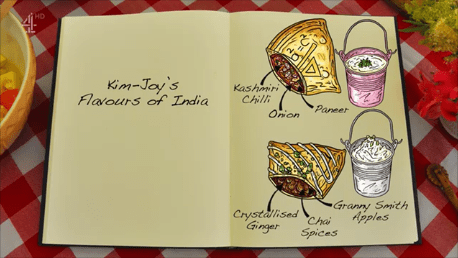 Everyone folds their dough, Kim-Joy forgot her spice! She won Spice Week! Dan's rolling his dough out by hand now while everyone else starts frying. Oh Ruby's look GORGEOUS! So do Manon's! Everyone's messed up their dips, folding and frying and pushing. 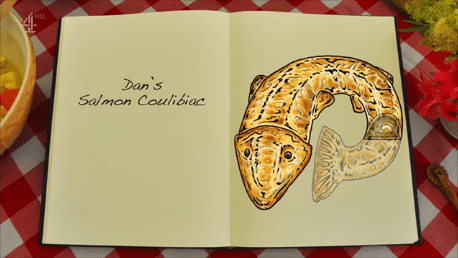 Dan's pastry is truly terrible, he's going to be riding the struggle bus the last ten minutes. 1 minute to go and since Dan spent the last 9 making faces at his cold, slow oil, he forgot to make a ganache. Hurry, Dan!! You've been rocksteady this entire time, you've got this! I don't know if I can watch Manon pout for the next 45 minutes, though. Gorgeous, beautifully crispy, very spicy, it's a juggernaut of flavour. Hollywood Handshake! *You know, someone said online that he's giving out too many of those and it's HIS HAND, people, if he wants to wave it around at any Dan, Rahul or Ruby, he can! 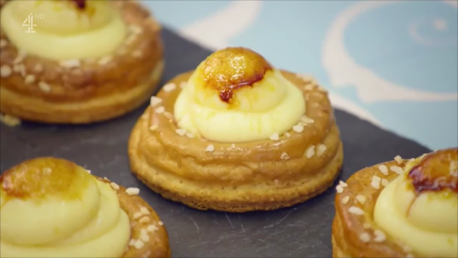 Soggy pastry here and there, but the flavours work well. 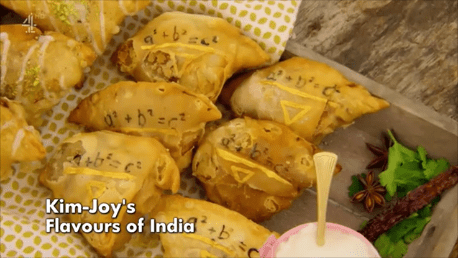 Kim-Joy's theme (you know she had one) was to write Pythagorean Theorem on each of her samosas because they're triangles, see? Light, beautiful flavours but not quite spicy enough. Oh they're bad. Bit tough. How pretty! So authentic looking, how do they taste? Absolutely delicious so Rahul can stop holding his nose. Prue gives him a double-hand shake-whatsits and threatens Paul with death if he doesn't give our little genius a handshake. Hollywood Handshake! 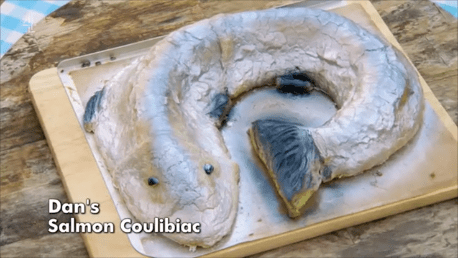 *Things have gotten rather complicated on GBBO. Manon's been shoutily pouting (full lower lip extension, I haven't seen the likes of that since my kids were in preschool) since her samosas split, but Prue and Paul aren't impressed with everything else too. It's anyone's game this week! We're on to the Technical Challenge so I've got my Google open! It's 12 Puits D'Amor and a bunch of complicated processes to bring us out Well of Love. Briony and Dan forgot their sugar. but Briony knows to not open the oven to add it and Dan does not. Oh nooo, Ruby's are so burnt. So are Manon's. Dan's are flat. Jon's are okay, Briony's are fine, Dan cries. Briony and Jon knock it out of the park, here is everyone in order of worst to best: Ruby, Dan, Kim-Joy, Manon, Rahul, Jon and Briony wins! Good job, lady! This is your day! This is not Dan's day, I'm afraid. Take the night off, come back fresh, you've got this! 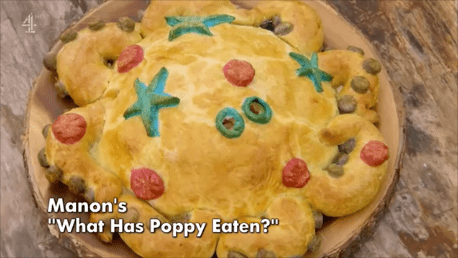 We're onto the Showstopper already, Paul and Prue want to see a Shaped Banquet Pie, which is a pie for sharing. Aren't ALL pies for sharing? Who are all you pie-hoarders out there?? 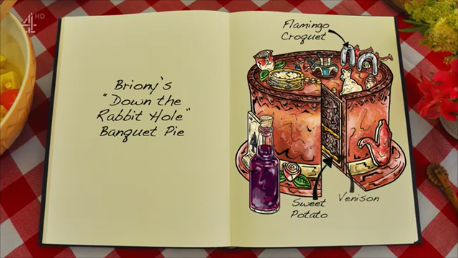 Ohh, Briony's Alice in Wonderland dress/shirt is just the beginning, it's the theme of her shaped pie! I don't understand Dan's whatsit. 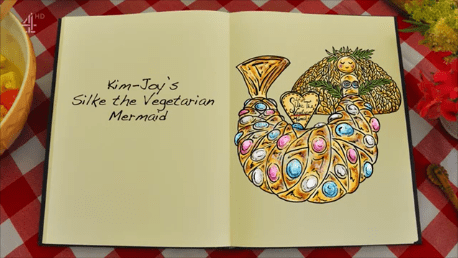 Oh Kim-Joy is making a mermaid thingy! I love it! Oh. She's using beets. Pass. 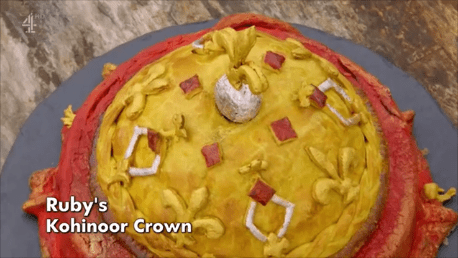 Lookit Jon's Welsh Dragon Something with puff pastry! They make a big deal out of his meat mincer but I have the exact same one: Pampered Chef Canada. I'm pretty sure I've never used mine, though, I bought it to be polite at an (AWFUL) neighbour's party and have ignored it since because I have a 20-year-old wooden spoon that's never let me down. He's working his mincer like a rented mule. 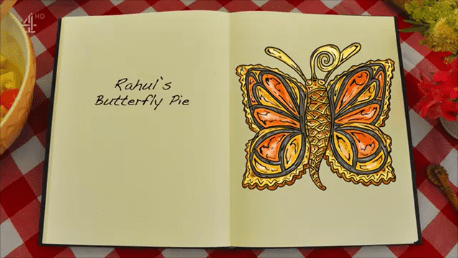 Then gets into an argument about whether butterflies have tentacles or antennae and they're BOTH wrong: Rahul is talking about the proboscis. Thank you class field trip to the Muttart Conservatory! 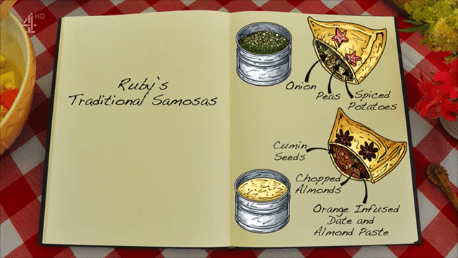 Ruby's making curry filling too. We're all worried about Dan. You're pretending to eat octopus? Noel has worked himself into a lather. Briony forgot the steam hole for her pie! Dan is behind again! Honestly, I know I've whined about Dan previously, but he's just having a bad weekend, he can't go! 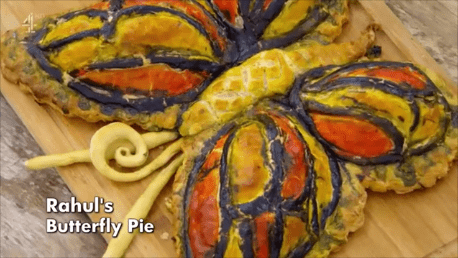 Oh my goodness, so many great shaped pies! Except Rahul's, his is not on. It's everywhere. Bake, Dan, BAKE! There's no time!! Everyone's leaking! 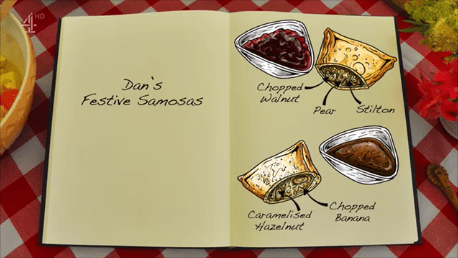 Dan's pie isn't baking! 1 minute!!! It doesn't look bad! She used puff pastry but didn't have quite enough time, just a little too soggy. 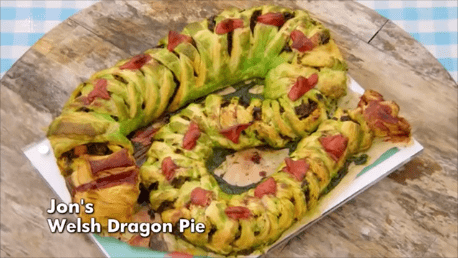 Prue calls it a "monster sausage roll" and now I want a monster sausage roll more than anything ever. Too wet from the puff pastry but tastes great. 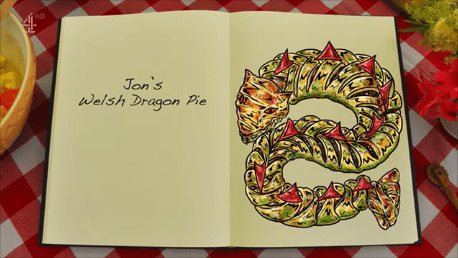 I love the part where Paul asked where the wings were, Jon retorted that not all dragons have wings and Sandi offered to mediate this reality check. Oh Dan. All the fingers crossed. I love it! Unfortunately it has a bit of baking paper stuck to it and is too salty and dry yet too wet. Lookit how awesome that is! Prue loves it, including the tiny bottles of port. She does what I do when I'm really enjoying what I'm eating, rocking back and forth and humming. 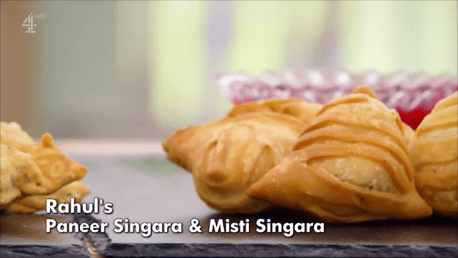 *Since I'm just talking about myself and we have to wait for the judges to decide ANYWAY, here's a link to my Tortiere recipe, I love it. And we're back! 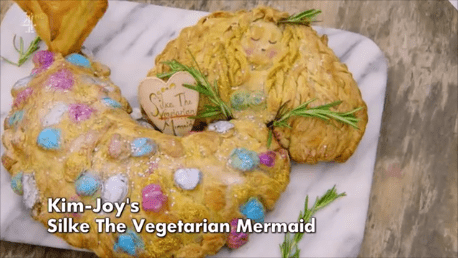 Briony's a shoo-in for Star Baker, hey? Rahul's always in there, they discuss Dan's gift an suddenly we're to it. 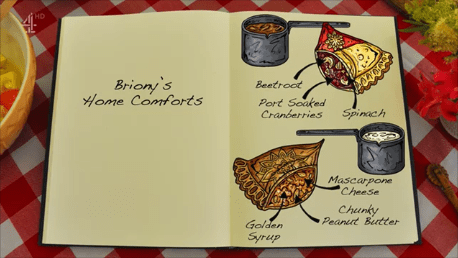 Star Baker is: Briony! Yay! But going home is: (I'm worried it's Manon) but no, it's Dan. Oh Dan. They just said he had a gift! Oh and he makes me cry when he talks about being a stay-at-home-parent and how difficult it is to feel special. He did this for him. Briony calls her family who scream and shout at her win, yay! Next week is vegan week. I don't understand. How does one bake without eggs and butter? I do have a friend (and a brother) who will find this very exciting, however, until then! Cheers.